I’m sorry. We are returning to Roth. I could, I suppose, not write this blog, but at this point it’s too late. I’m committed. I am attempting to wring one final piece of information from those race results, stretching what little predictive power they have to its limits. 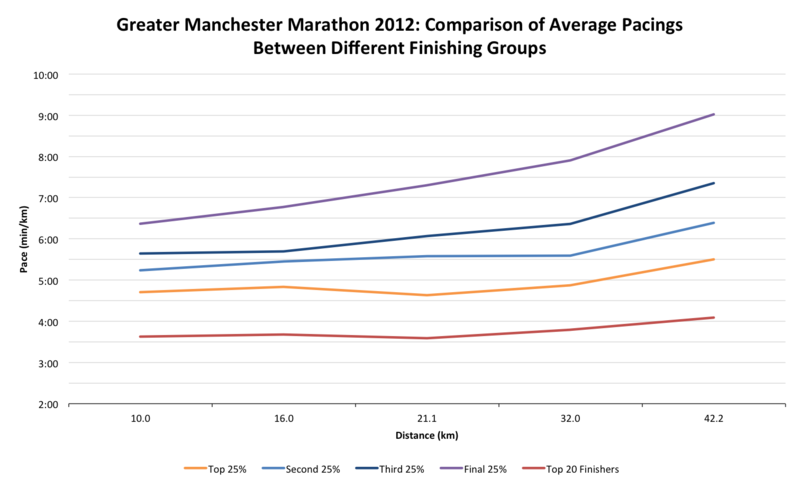 I’m going to concentrate on the marathon, taking advantage of the splits in the data to examine the relationship between overall performance and pacing at the event. Then I’m going to speculate, I’m going to assume and I’m going to make suggestions on the basis of no more than a handful of data. 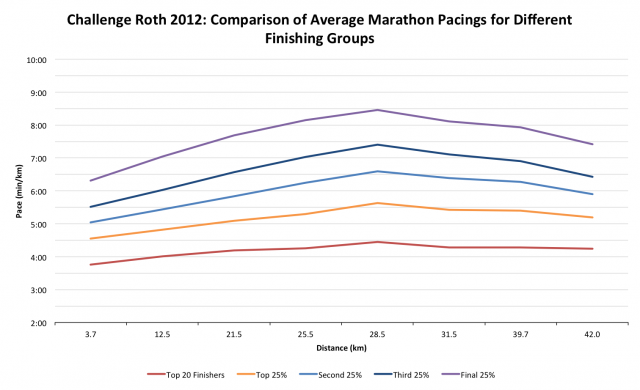 Once again it starts with Roth and a marathon I did not enjoy. To simplify these chart, I’ve divided each field into quarters and then included the top twenty finishers for comparison with the very front of pack. 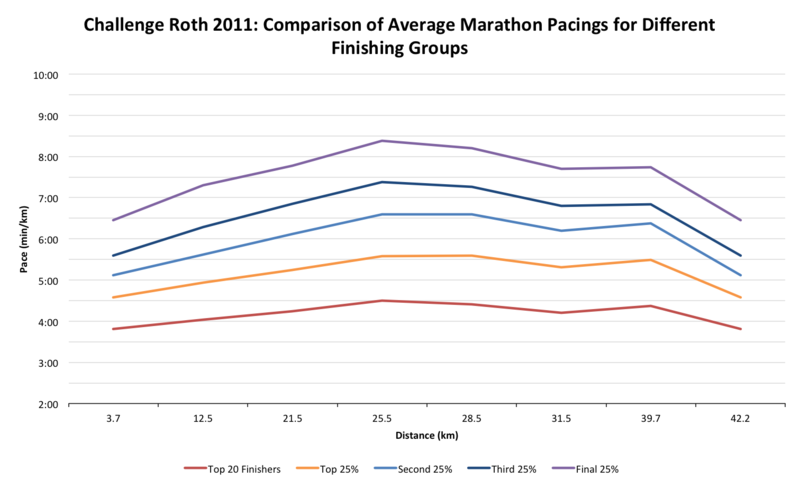 Each line traces the change in average pacing between check points, for example, the top twenty in Roth averaged 3:46 min/km for the first 3.7K. Fast athletes going fast again. What’s more interesting, at least to me, is the similarity between the finishers; the trend – one I did not reflect in my own race – is to progressively slow until around 28K, then to gradually pick up the pace again, finishing strongly. A classic case of starting out too hard, slowing, but pushing to the finish? 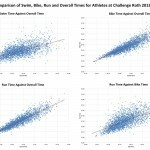 There are a couple of stumbling blocks to deal with: firstly I make no allowance for the terrain, and while Roth is not hilly there are gradients that could certainly – in part – account for changes in pace; secondly I had to tweak the data, merging the times for a blatantly misplaced mat into the final 42K pacing. Yes, the race was 200m short, or rather, there’s enough speculation about the distance that I decided to go with my GPS which sat comfortably between those who had found it to be the correct length and those who had found it to be significantly shorter. 2012 had a new addition and adjustments to the marathon course, so it’s hard to compare the distance with previous years. But on a largely similar course we see similar trends, terrain almost certainly playing a roll, but striking for how uniform the race is across the board. Everyone runs the first 3.7K – which includes some climbing – faster than all but the last few kilometres. All those brick sessions have worked, nice and fast off the bike, too fast, perhaps more emphasis on controlling that early pace would be more effective? I needed more results and fortunately found an old spreadsheet from Ironman Western Australia; that was a race I enjoyed. Three pan flat laps, terrain doesn’t play a role, but in 2009 there was heat to deal with. 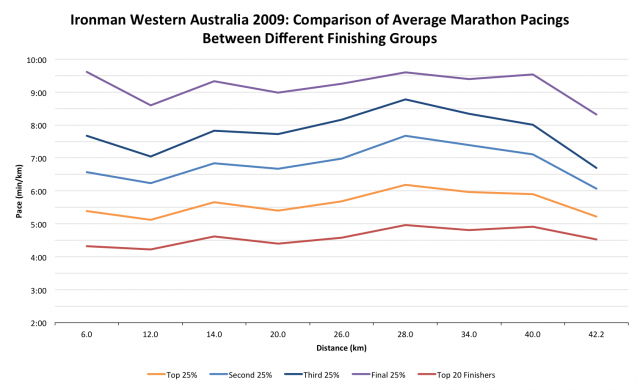 Again, across the race there are similar trends, and while the first 6km are not as fast, athletes slow until around 28K – the final lap – then there is a slight increase in pace. If these three results are to be believed as a group we tend to lose speed until we pull ourselves together for the final third of the marathon. How does that compare to a marathon? Without the hassle of swimming and cycling beforehand there is a very different trend at the Greater Manchester Marathon: the pace is higher, standalone marathon running is a much faster game than Ironman running, but then there is a slow attrition across the length of the race, no pick up, just hold on until the line. 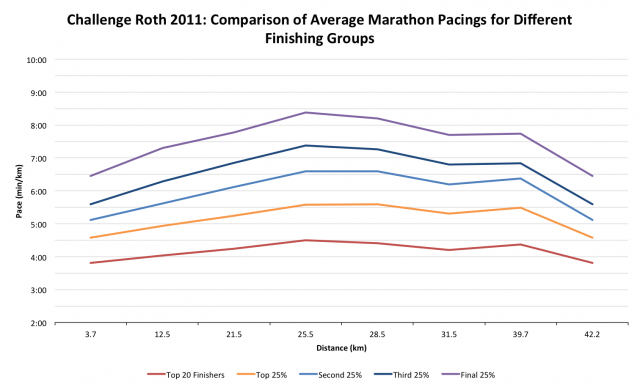 There’s insufficient granularity in the splits to see if they manage to push out that final mile, but this fits the positive split model of pacing. 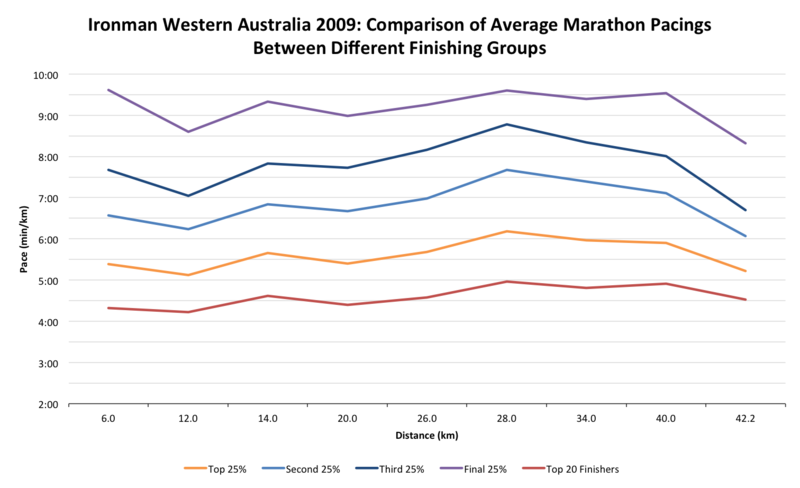 Curiously the pace in Roth is not significantly slower than the comparable pace in Manchester, perhaps reflecting the breadth of the field at a large UK marathon; on the other hand Western Australia compares less favourably, a much slower run in hot conditions following the pan flat 180km time trial. Broadly speaking – speculating – athletes race in similar fashions. The marathoner heads out at the pace they believe they can sustain for the distance, a touch to fast and slowly fades as fatigue predominates. 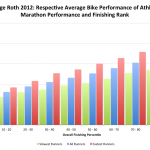 The Ironman similarly leaves transition faster than they can sustain, perhaps close to how they might start a marathon, and then quickly slows to a much lower pace, low enough that in the final third of their race they can sustain or push it on. The difference is how close to their limit the two respective athletes are working and how much they have in reserve. The Ironman is soon well below what might be considered their marathon pace which with correct fuelling gives scope to raise the effort later in the day; fatigue and nutrition are limiting factors, but chances are they fall away from that limit and potentially regroup. The difference between fastest and slowest comes down to speed, of course, and the rate of decline. Correct training and correct pacing mean the fast athletes not only start faster, they slow less. They are faster, but it’s significant that they are able to sustain their pace better than the rest of the field. It’s worth considering when planning your Ironman, or marathon – being realistic in your targets, controlling how you race, recognising that some fade is inevitable and working towards a strategy to minimise it.